A long vowel is a vowel sound that is pronounced the same way as the name of the letter itself. For example, the long U sound is pronounced like "yoo," as would be the case in words like "lure" and "tube." By contrast, the short U sound is pronounced more like "uh," as in words like "cub" and "tub." 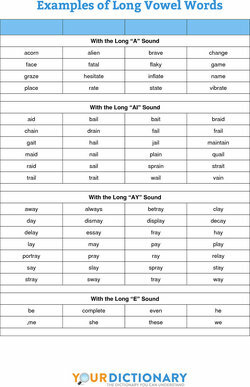 Long vowel words, then, are words that contain a long vowel sound. It's important to note that the spelling of a word and the way it sounds don't always match up so perfectly. Words like "few" and "beauty" also contain the long U sound. Similarly, the long A sound in "bake" and "gate" can also be spelled like "ay" (as in "pay") or "ai" (as in "paid"), among other variations. To understand this further, let's look at some more examples of long vowel words. A great way to understand how long vowel words work is to see them in action in full sentences. The long A sound is featured in the words in bold. Can you bake me a cake? There's no way I'm going to pay for that. At this rate, they'll never come home. Jenny does it for the fame and fortune. Did you hear about the raid on the executive's office? The long E sound is featured in the words in bold. Pete plans to see her again soon. The gymnast excels on the high beam. The behavior was deemed inappropriate by the ethics board. That was quite the scene at the deli. The long I sound is featured in the words in bold. Sara and I are going to the movies. The pine needles are everywhere! You'll find the jam in the bread aisle. Take a right turn at the next intersection. The long O sound is featured in the words in bold. The Lone Ranger is a famous fictional character. The country road isn't paved. Herbert was so excited, he started jumping up and down. Can you fetch me a hoe from the garden shed? The tow truck arrived just in time. 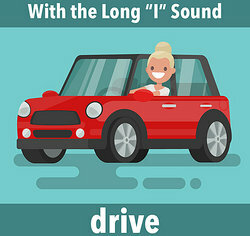 The long U sound is featured in the words in bold. The rude waitress still hasn't taken our order. Have you seen the Statue of Liberty? The Duke and Duchess of York visited recently. With a queue like that, we can expect a very long wait. There he is, right on cue. The English language is filled with all sorts of confusing words. The word "read" can rhyme with "fed" (short E sound), but it can also rhyme with "seed" (long E sound), depending on which verb tense you're trying to use with "read." As you continue to brush up on your knowledge of vowels and how they work, why not study words that end in a silent E? There are a lot of them! For something more creative, check out these assonance examples too. "Examples of Long Vowel Words." YourDictionary, n.d. Web. 18 April 2019. <https://examples.yourdictionary.com/examples-of-long-vowel-words.html>. A long vowel is a vowel sound that is pronounced the same way as the name of the letter itself. For example, the long U sound is pronounced like "yoo," as would be the case in words like "lure" and "tube." By contrast, the short U sound is pronounced more like "uh," as in words like "cub" and "tub." Long vowel words, then, are words that contain a long vowel sound. It's important to note that the spelling of a word and the way it sounds don't always match up so perfectly. Words like "few" and "beauty" also contain the long U sound. Similarly, the long A sound in "bake" and "gate" can also be spelled like "ay" (as in "pay") or "ai" (as in "paid"), among other variations.To understand this further, let's look at some more examples of long vowel words.